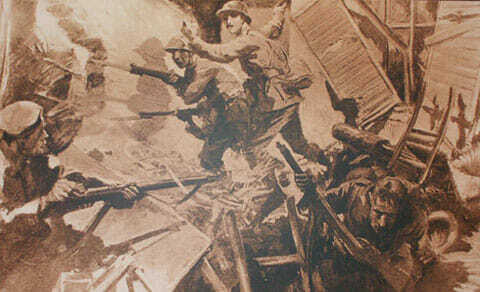 Welcome to the Athy Heritage Centre-Museum’s World War 1 page. This page is a comprehensive guide to World War 1 in Athy with information on all of County Kildare, Ireland including local newspaper reports and a list of men from County Kildare who were killled during the war. Through this site we hope to give some idea of how the Great War impacted on Ireland. A nun from the local convent of Mercy had noted that men: “every other day came to the convent before their departure to beg for sacred heart scapulars to take away with them. Few of these poor fellows ever saw home again.” A local committee formed by Lady Weldon of Kilmoroney House collected funds to improve the comfort of the Athy soldiers. The local golf club put on entertainment for the benefit of convalescing troops. Athy technical School manufactured splints, bedrests, bed tray tables and crutches as part of the Irish War Hospitals Supply Depot Scheme.